The NavigationView control provides top-level navigation for your app. It adapts to a variety of screen sizes and supports both top and left navigation styles. Some features of NavigationView, such as top navigation, require Windows 10, version 1809 (SDK 17763) or later, or the Windows UI Library. Providing a consistent navigational experience throughout your app. Preserving screen real estate on smaller windows. Organizing access to many navigation categories. For other navigation patterns, see Navigation design basics. 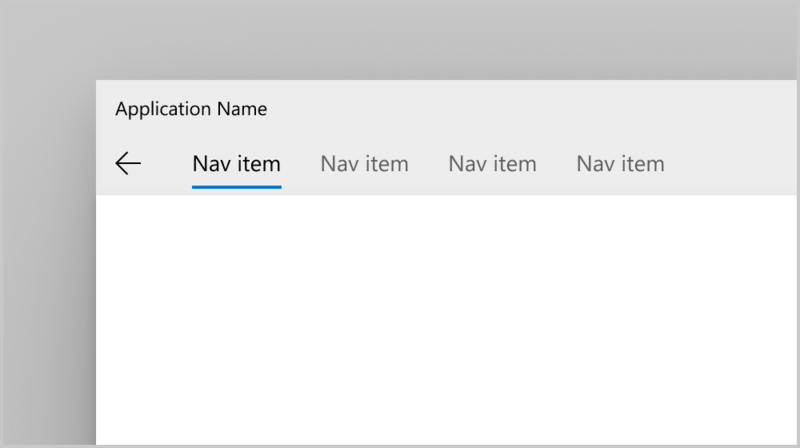 If you have the XAML Controls Gallery app installed, click here to open the app and see the NavigationView in action. The PaneDisplayMode property requires Windows 10, version 1809 (SDK 17763) or later, or the Windows UI Library. You can use the PaneDisplayMode property to configure different navigation styles, or display modes, for the NavigationView. The pane is positioned above the content. 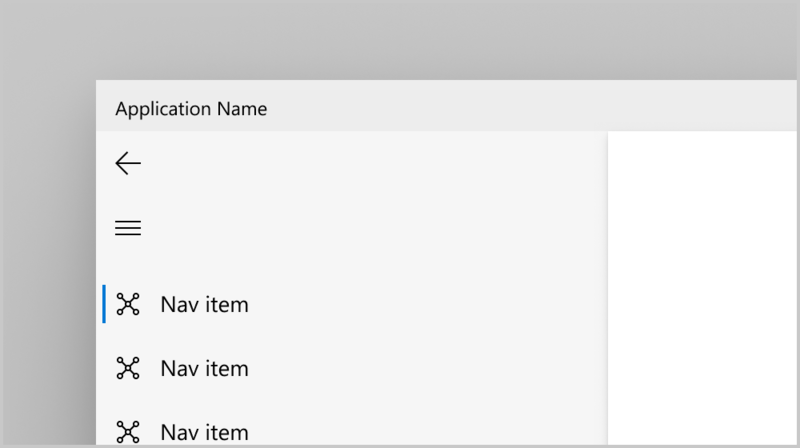 You have 5 or fewer top-level navigation categories that are equally important, and any additional top-level navigation categories that end up in the dropdown overflow menu are considered less important. You need to show all navigation options on screen. You want more space for your app content. Icons cannot clearly describe your app's navigation categories. The pane is expanded and positioned to the left of the content. You have 5-10 equally important top-level navigation categories. You want navigation categories to be very prominent, with less space for other app content. The pane shows only icons until opened and is positioned to the left of the content. Only the menu button is shown until the pane is opened. When opened, it's positioned to the left of the content. By default, PaneDisplayMode is set to Auto. In Auto mode, the navigation view adapts between LeftMinimal when the window is narrow, to LeftCompact, and then Left as the window gets wider. For more info, see the adaptive behavior section. These images show the layout of the pane, header, and content areas of the control when configured for top or left navigation. You can use the PaneDisplayMode property to position the pane above the content or to the left of the content. NavigationViewItem objects. Navigation items for navigating to specific pages. NavigationViewItemSeparator objects. Separators for grouping navigation items. Set the Opacity property to 0 to render the separator as space. NavigationViewItemHeader objects. 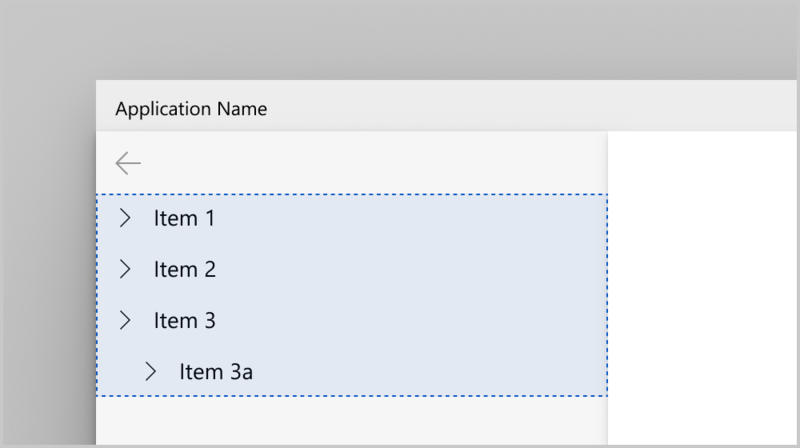 Headers for labeling groups of items. An optional AutoSuggestBox control to allow for app-level search. Assign the control to the NavigationView.AutoSuggestBox property. An optional entry point for app settings. To hide the settings item, set the IsSettingsVisible property to false. A menu button to toggle the pane opened and closed. On larger app windows when the pane is open, you may choose to hide this button using the IsPaneToggleButtonVisible property. The navigation view has a back button that is placed in the top left-hand corner of the pane. However, it does not automatically handle backwards navigation and add content to the back stack. To enable backwards navigation, see the backwards navigation section. Here is the detailed pane anatomy for the top and left pane positions. You can place free-form content in the pane's footer by adding it to the PaneFooter property. You can place text content in the pane header area by setting the PaneTitle property. It takes a string and shows the text next to the menu button. To add non-text content, such as an image or logo, you can place any element in the pane's header by adding it to the PaneHeader property. 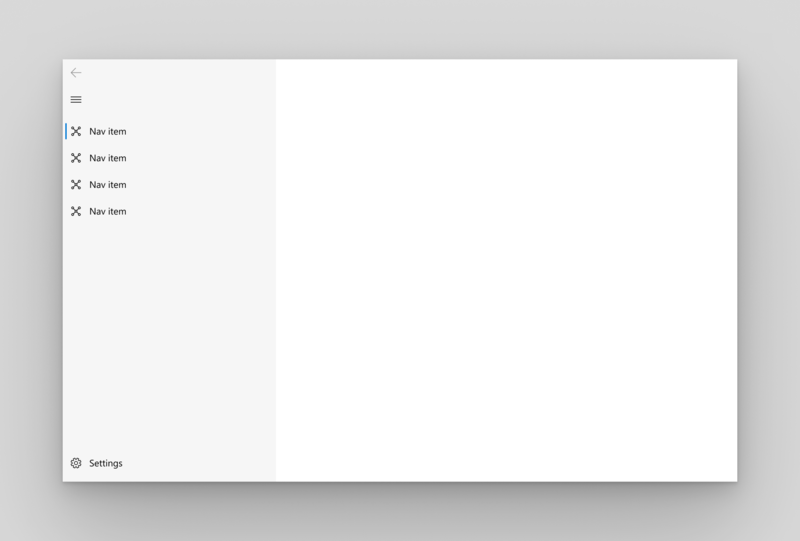 If both PaneTitle and PaneHeader are set, the content is stacked horizontally next to the menu button, with the PaneTitle closest to the menu button. You can place free-form content in the pane by adding it to the PaneCustomContent property. You can add a page title by setting the Header property. The header area is vertically aligned with the navigation button in the left pane position, and lies below the pane in the top pane position. It has a fixed height of 52 px. Its purpose is to hold the page title of the selected nav category. The header is docked to the top of the page and acts as a scroll clipping point for the content area. The header is visible any time the NavigationView is in Minimal display mode. 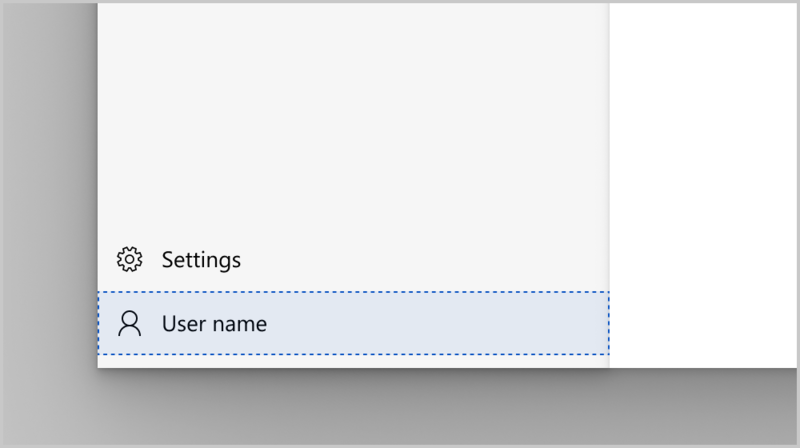 You may choose to hide the header in other modes, which are used on larger window widths. 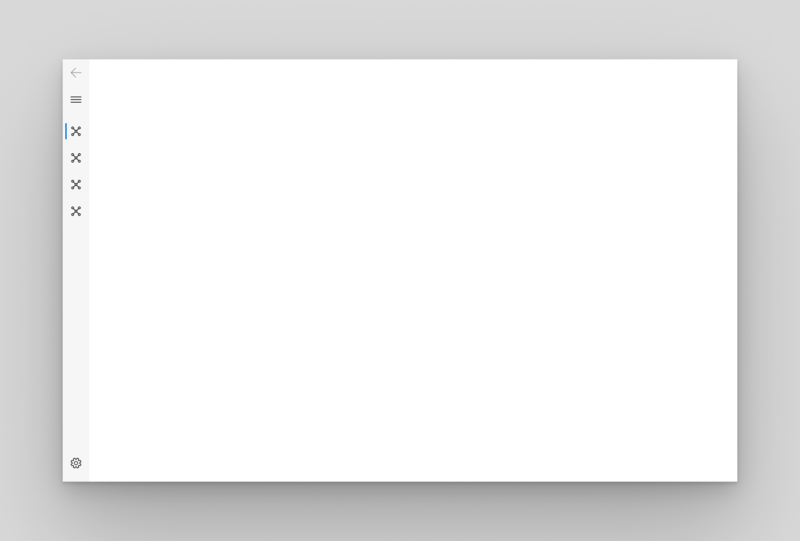 To hide the header, set the AlwaysShowHeader property to false. The content area is where most of the information for the selected nav category is displayed. We recommend 12px margins for your content area when NavigationView is in Minimal mode and 24px margins otherwise. By default, the navigation view automatically changes its display mode based on the amount of screen space available to it. The CompactModeThresholdWidth and ExpandedModeThresholdWidth properties specify the breakpoints at which the display mode changes. You can modify these values to customize the adaptive display mode behavior. An expanded left pane on large window widths (1008px or greater). A left, icon-only, nav pane (LeftCompact) on medium window widths (641px to 1007px). Only a menu button (LeftMinimal) on small window widths (640px or less). For more information about window sizes for adaptive behavior, see Screen sizes and breakpoints. A second common adaptive pattern is to use an expanded left pane on large window widths, and only a menu button on both medium and small window widths. You want more space for app content on smaller window widths. Your navigation categories cannot be clearly represented with icons. To configure this behavior, set CompactModeThresholdWidth to the width at which you want the pane to collapse. Here, it's changed from the default of 640 to 1007. You should also set ExpandedModeThresholdWidth to ensure the values don't conflict. A third common adaptive pattern is to use an expanded left pane on large window widths, and a LeftCompact, icon-only, nav pane on both medium and small window widths. It is important to always show all navigation options on screen. Your navigation categories can be clearly represented with icons. To configure this behavior, set CompactModeThresholdWidth to 0. To disable the automatic adaptive behavior, set PaneDisplayMode to a value other than Auto. Here, it's set to LeftMinimal, so only the menu button is shown regardless of the window width. As described previously in the Display modes section, you can set the pane to be always on top, always expanded, always compact, or always minimal. You can also manage the display modes yourself in your app code. An example of this is shown in the next section. When you use top navigation in your app, navigation items collapse into an overflow menu as the window width decreases. 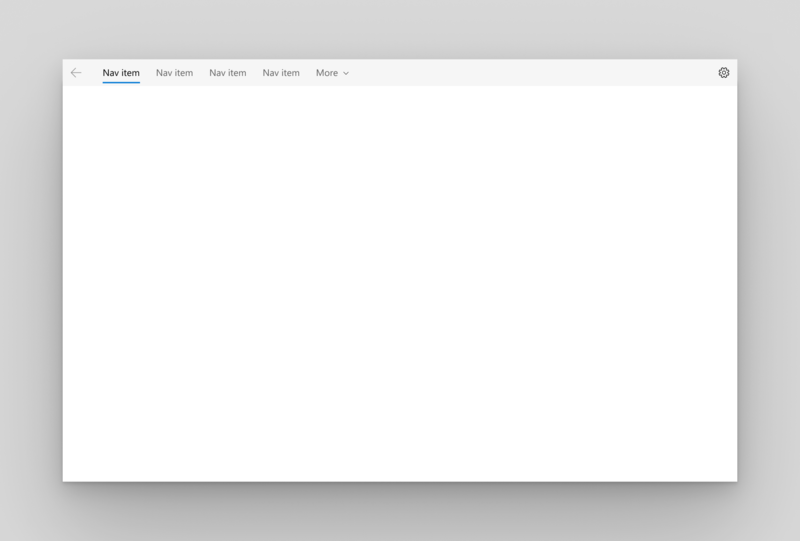 When your app window is narrow, it can provide a better user experience to switch the PaneDisplayMode from Top to LeftMinimal navigation, rather than letting all the items collapse into the overflow menu. You have a set of equally important top-level navigation categories to be displayed together, such that if one category in this set doesn't fit on screen, you collapse to left navigation to give them equal importance. You wish to preserve as much content space as possible in small window sizes. 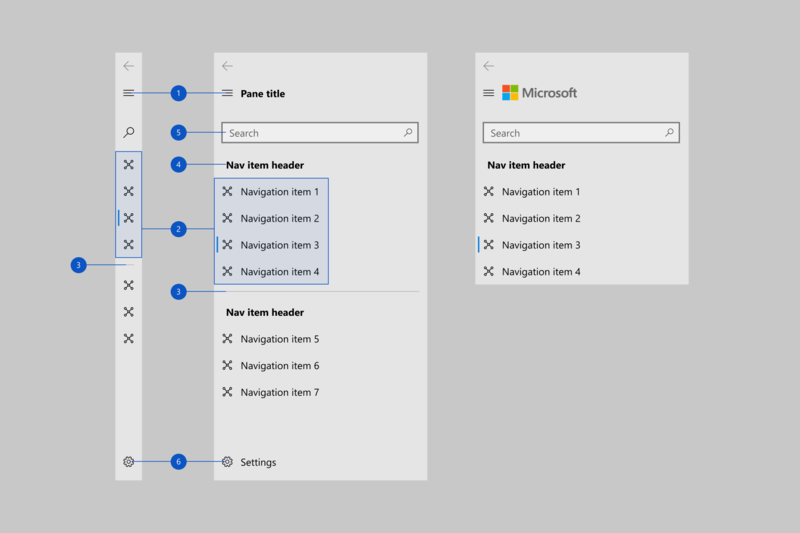 This example shows how to use a VisualStateManager and AdaptiveTrigger.MinWindowWidth property to switch between Top and LeftMinimal navigation. When you use AdaptiveTrigger.MinWindowWidth, the visual state is triggered when the window is wider than the specified minimum width. 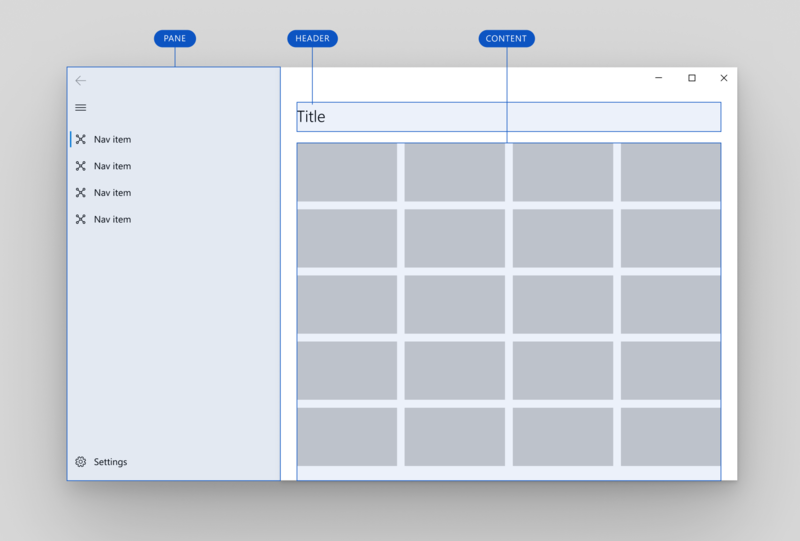 This means the default XAML defines the narrow window, and the VisualState defines the modifications that are applied when the window gets wider. The default PaneDisplayMode for the navigation view is Auto, so when the window width is less than or equal to CompactModeThresholdWidth, LeftMinimal navigation is used. 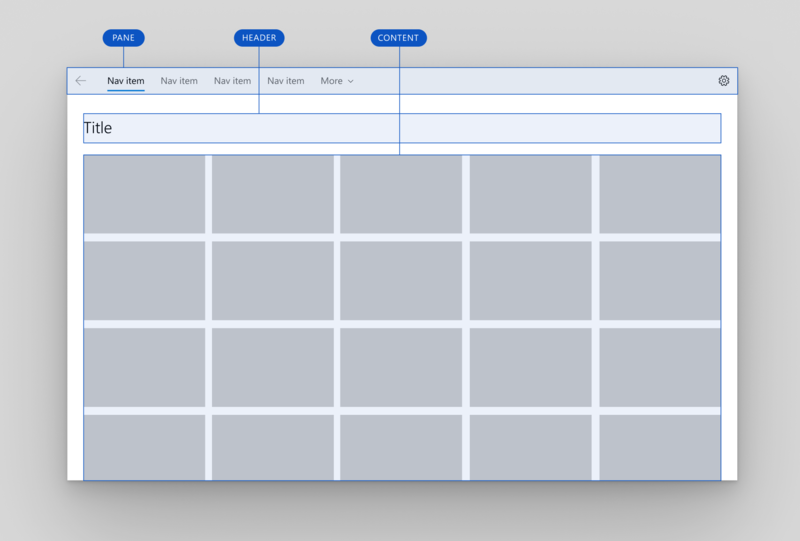 When the window gets wider, the VisualState overrides the default, and Top navigation is used. The navigation view doesn't perform any navigation tasks automatically. When the user taps on a navigation item, the navigation view shows that item as selected and raises an ItemInvoked event. If the tap results in a new item being selected, a SelectionChanged event is also raised. You can handle either event to perform tasks related to the requested navigation. Which one you should handle depends on the behavior you want for your app. Typically, you navigate to the requested page and update the navigation view header in response to these events. 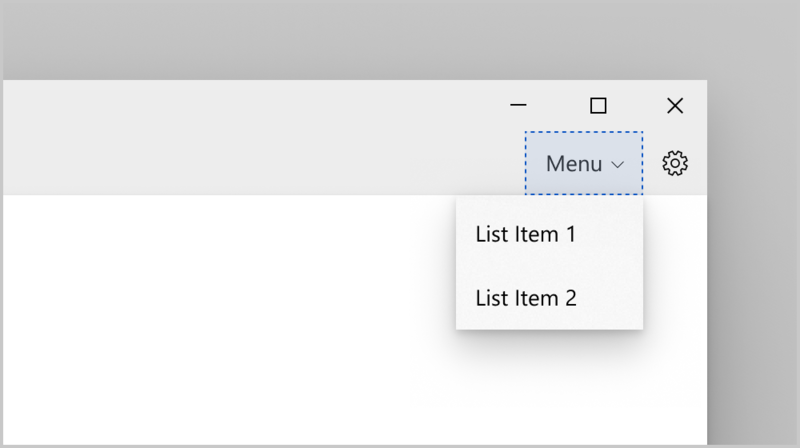 SelectionChanged can be raised by a user invoking an item that isn't currently selected, or by programmatically changing the selected item. If the selection change occurs because a user invoked an item, the ItemInvoked event occurs first. If the selection change is programmatic, ItemInvoked is not raised. NavigationView has a built-in back button; but, as with forward navigation, it doesn't perform backwards navigation automatically. When the user taps the back button, the BackRequested event is raised. You handle this event to perform backwards navigation. For more info and code examples, see Navigation history and backwards navigation. 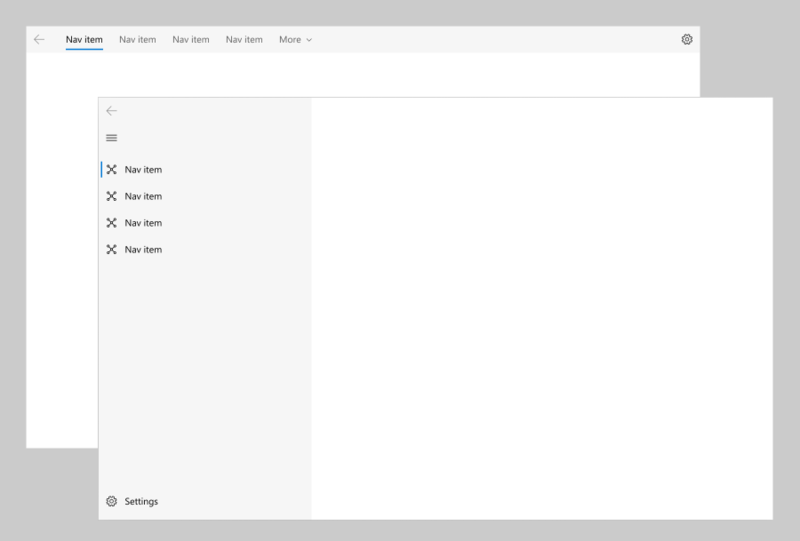 In Minimal or Compact mode, the navigation view Pane is open as a flyout. In this case, clicking the back button will close the Pane and raise the PaneClosing event instead. IsBackButtonVisible: use to show and hide the back button. This property takes a value of the NavigationViewBackButtonVisible enumeration, and is set to Auto by default. When the button is collapsed, no space is reserved for it in the layout. IsBackEnabled: use to enable or disable the back button. You can data bind this property to the CanGoBack property of your navigation frame. BackRequested is not raised if IsBackEnabled is false. 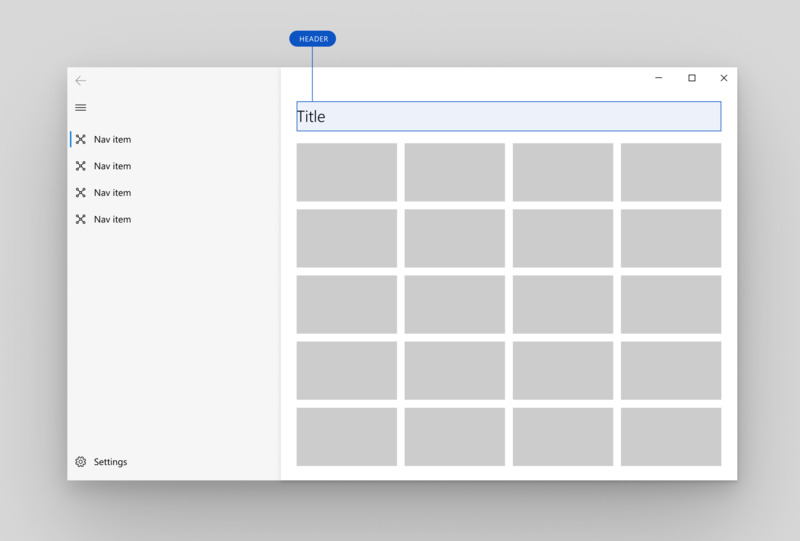 This example shows how you can use NavigationView with both a top navigation pane on large window sizes and a left navigation pane on small window sizes. It can be adapted to left-only navigation by removing the top navigation settings in the VisualStateManager. The example demonstrates a recommended way to set up navigation data that will work for many common scenarios. It also demonstrates how to implement backwards navigation with NavigationView's back button and keyboard navigation. This code assumes that your app contains pages with the following names to navigate to: HomePage, AppsPage, GamesPage, MusicPage, MyContentPage, and SettingsPage. Code for these pages is not shown. Information about the app's pages is stored in a ValueTuple. This struct requires that the minimum version for your app project must be SDK 17763 or greater. If you use the WinUI version of NavigationView to target earlier versions of Windows 10, you can use the System.ValueTuple NuGet package instead. This code shows how to use the Windows UI Library version of NavigationView. If you use the platform version of NavigationView instead, the minimum version for your app project must be SDK 17763 or greater. To use the platform version, remove all references to muxc:. This code shows how to use the Windows UI Library version of NavigationView. If you use the platform version of NavigationView instead, the minimum version for your app project must be SDK 17763 or greater. To use the platform version, remove all references to muxc. // Add "using" for WinUI controls. // You can also add items in code. // Add handler for ContentFrame navigation. // NavView doesn't load any page by default, so load home page. // If navigation occurs on SelectionChanged, this isn't needed. // here to load the home page. // Add keyboard accelerators for backwards navigation. <!-- NavView_SelectionChanged is not used in this example, but is shown for completeness. // entries in the backstack. // Only navigate if the selected page isn't currently loaded. // Don't go back if the nav pane is overlayed. // SettingsItem is not part of NavView.MenuItems, and doesn't have a Tag. Below is a C++/WinRT version of the NavView_ItemInvoked handler from the C# code example above. 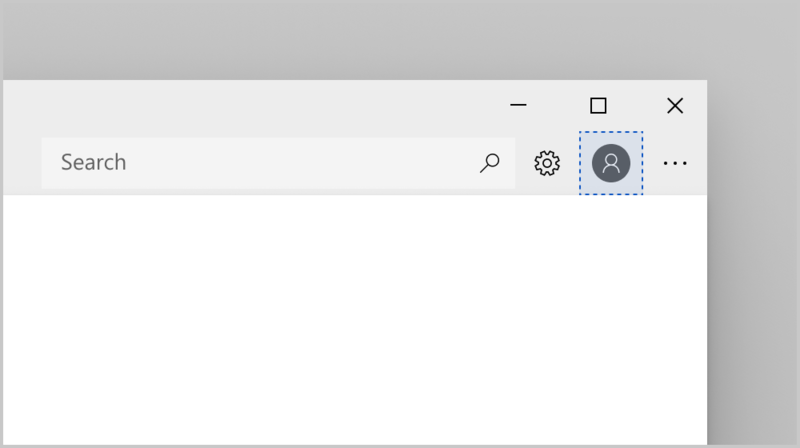 The technique in the C++/WinRT handler involves you first storing (in the tag of the NavigationViewItem) the full type name of the page to which you want to navigate. 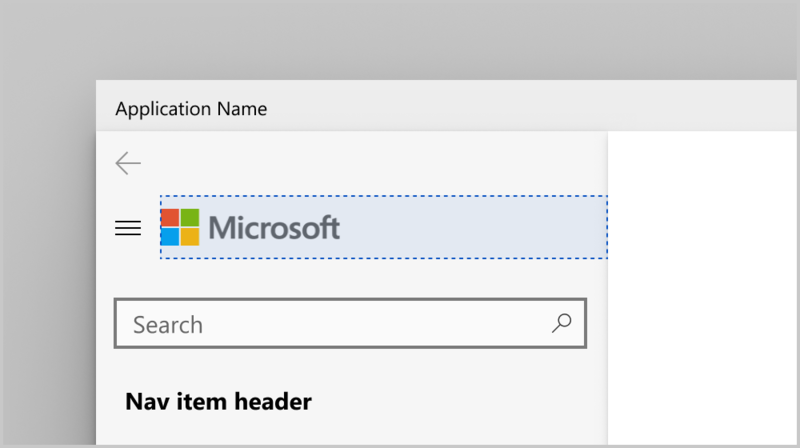 In the handler, you unbox that value, turn it into a Windows::UI::Xaml::Interop::TypeName object, and use that to navigate to the destination page. There's no need for the mapping variable named _pages that you see in the C# example; and you'll be able to create unit tests confirming that the values inside your tags are of a valid type. Also see Boxing and unboxing scalar values to IInspectable with C++/WinRT. the pane is a solid grey color when expanded on the left, side-by-side with the content (in Left mode). the pane uses in-app acrylic when open as an overlay on top of content (in Top, Minimal, or Compact mode). This table shows which theme resource is used in each display mode. 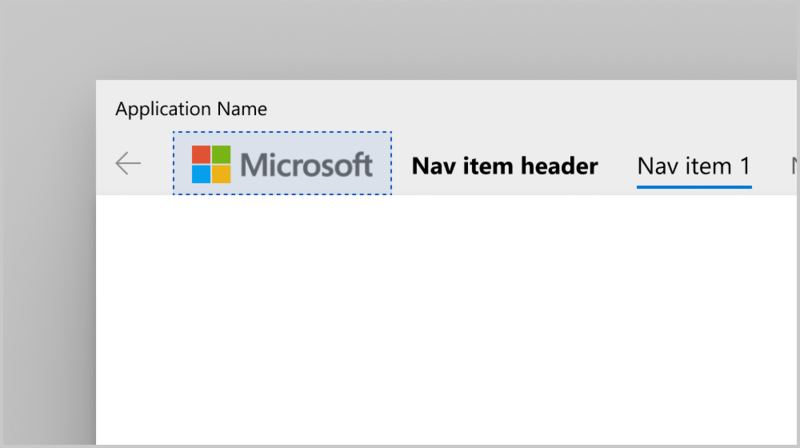 This example shows how to override the theme resources in App.xaml. When you override theme resources, you should always provide "Default" and "HighContrast" resource dictionaries at a minimum, and dictionaries for "Light" or "Dark" resources as needed. For more info, see ResourceDictionary.ThemeDictionaries. This code shows how to use the Windows UI Library version of AcrylicBrush. If you use the platform version of AcrylicBrush instead, the minimum version for your app project must be SDK 16299 or greater. To use the platform version, remove all references to muxm:.